Medical Office (New York) - Book Appointment Online! 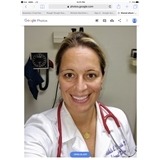 I feel very comfortable with Danielle Dietzek, NP. I dont see myself changing. SHE REALLY LISTENS TO ME! and really takes her time. She feels my pain and will do anything to ensure that I feel better. She just cares and I appreciate that more than anything. Especially in NYC, where doctors are just in and out and see you as a number. I cant wait to finally have my full Physical so that she can help me figure out all my health concerns.